Poor Audra came down with another cold this week :( I'm not even sure what number this is, but it seems like a lot, especially for such a young baby. So she's congested again, and the last few nights she has been up coughing for an hour or more before it eased up enough for her to fall back asleep. I've been running a cool mist humidifier (and diligently doing her baby massage in hopes of avoiding another ear infection), but it's so hard to not be able to do anything else for her beyond that. Audra was also more fussy than normal this past week - crying whenever I'd put her down and/or go in the other room, screaming and crying hard with Ryan while I was out with Josie one afternoon and only stopping to inspect a knot in the wood floor of the porch (and for Josie, once we returned). I suspect it's a combination of being tired (she had only napped for an hour total before I had left with Josie) and another development leap. My trusty "Wonder Weeks" book says this is to be expected around this age, as babies start to understand distances more and it becomes more alarming to them to see how little they are in this big world, and that their caretakers are further away than they'd prefer. But then Audra took a 3.5-hour nap one afternoon (after a half-hour nap in the morning too) and was simply delightful for the rest of the day, so maybe it is just more tiredness than anything. 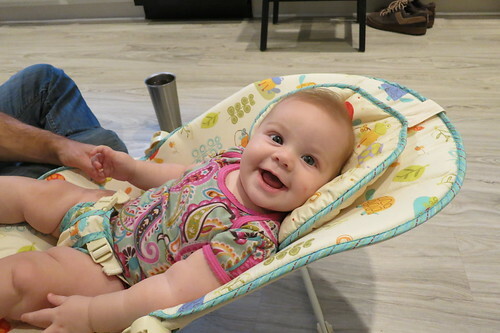 But even when she's fussier at home, she's able to calm down and bring out some smiles and giggles so long as Josie is around :) Josie usually just needs to look at Audra to make her laugh, but Audra makes Ryan and me work for it a bit more. Our go-to methods of getting her to laugh are for Ryan to rub her belly with his head, or for me to blow raspberries on her belly or kiss/nom on her ears or neck. Audra also seems to do quite well entertaining herself in the pack n play, which is good, since I have a feeling she'll be spending more quality time there soon enough - Ryan has been taking her on his morning walk when she's up before our 6:10am alarm (which is just about every morning) so that I can get ready for work in peace, but pretty soon she's going to be too heavy for him to schlep around for that far comfortably. 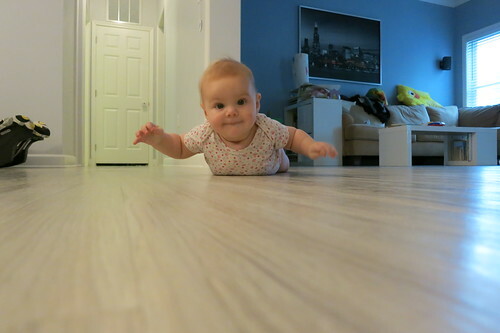 She's able to maneuver herself around quite well on the floor, and while she hasn't tried lifting her whole torso up and crawling too much yet, she does scoot around on her back on the floor, and can also push herself forward with just her toes. 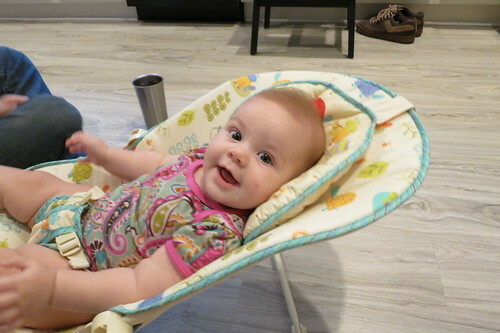 She is remarkably persistent and deliberate in getting around too - she'll roll and twist and scoot herself all over the floor in pursuit of toys (including lots of pounding on the floor), and seems to have a pretty high tolerance before she gets frustrated.